So, next Thursday I'll be celebrating Thanksgiving with a number of 'west-side' PCVs in Arad. It should be a good time. I'm thinking I'd like to take a salad or something. If any of you out there have suggestions or recipes, please send them along! So I've started writing short articles for the local newspaper here in Lugoj, "Redesteptarea" (which I suppose would loosely translate as 'The Awakener'). My first piece, on being thankful, was published this week. I wrote it in English, emailed it to them and they translated it. I read it today, and the translation seems pretty close to what I wrote. However, they left out one very important thing. I described the typical Thanksgiving feast, with Turkey, mashed potatoes, cranberry sauce, stuffing, etc. The copied everything I said word for word. Everything, that is, except they completely left out any mention of stuffing! Alas, perhaps they didn't bother with it because there isn't any Romanian equivalent. Nevertheless, that well-loved, inimitable bread-based substance is a rather big part of the Thanksgiving feast and I think it deserves mention. I will do my best to start up a stuffing awareness campaign. November is here, which for me means it is time to give thanks. On the 22nd of November, my family and friends back home will be celebrating Thanksgiving. As the name of the holiday implies, it is a day when Americans show gratitude for the blessings in their life. Families typically gather together for a giant feast that usually consists of a large turkey, a seasoned bread-based substance we call “stuffing,” mashed potatoes, cranberry sauce, and, for desert, pumpkin pie (my favorite!). In my family the meal is a big tradition. My mother works in the kitchen for days preparing everything. My relatives come to our home and stay for a few days, traveling from localities as distant as Maine, Pennsylvania and Chicago. I have always enjoyed the food and vibrant company. 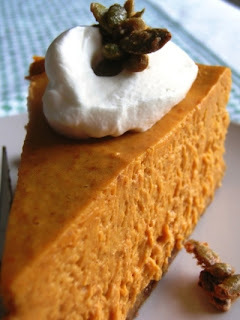 I especially enjoy my cousin Beth’s delicious pumpkin cheesecake, which is best with lots of whipped cream. So the last fews days of teaching have been pretty decent. I've assigned debate topics to my more advanced 12th graders, which requires them to do some research outside of class. On Wednesday and Thursday I had the first debate classes, and they went pretty well. One of the groups even brought in a laptop and gave a Powerpoint presentation! I look forward to next week's debate classes. I'm also planning to show "An Inconvenient Truth" to the classes that have already debated, since one of their topics was global warming. As for the younger kids, when I'm not teaching somewhat stale lessons out of a textbook, I make up worksheets on various topics. For example, I had one with a simple love story (only 7 lines long) and I had them add adjectives to it, as well as whole sentences. I also had a sheet with an advertisement, and we talked about advertising a bit (analyzing what adverts don't tell us). My latest worksheet was on jokes. I started out the class talking about humor, giving them vocab along the way, like slap-stick comedy. I even demonstrated some slap-stick by pretending to slip on a banana peel and fall on my rearend. The kids thought it was the funniest thing when their 'teacher' actually fell in the classroom (and some looked sort of shocked, not sure if it was on-purpose or not). I didn't plan a lesson for my 8th graders today. In fact, I walked in the door not really sure what I was going to do. Then it hit me, I'd have them write sentences. But, to make it fun, I had them work in groups. Each group had a sheet of paper, folded into four columns. In the first column one of the group members had to write a noun; in the second another group member wrote a verb; in the third, a preposition; and in the fourth, a place. The catch was that no one knew what the whole sentence was until the end, because each group member wrote their word without the rest of the group seeing it. They loved it. I remember one sentence was something like: "My earwax dripped on the coffin." I encouraged them to think of the wackiest nouns, verbs and adjectives they could. It worked so well, I ended up using it for my 9th graders too. They started out saying "aww man, are we gonna do grammar?? We're too cool for grammar!" But, by the end they were really into it. I also paid a visit to the school's library today. I'd peeked in before, and it looked intersting, but I didn't have enough time to really look around. However, today I had some free time. The librarian, rather excited I had stopped by, gave me a tour of the library's most prized possessions, including several books from the 1700's, and a HUGE leather atlas with many maps well over 200 years old. I found one map of Italy that was so old that the shape of the country looked nothing like the 'boot' peninsula we all know, and Sicily was massive. I'm guessing they didn't have Google Maps back then. There were also several maps of "Germany," well before the country was unified. The craftsmanship of these maps was impressive- many had intricate pen and ink artwork at the top, and some showed early attempts at topography (I never knew that hundreds of years ago mountians were arranged in neat grid-patterns). Also included was a German world map, which depicted the Americas, the Thirteen Colonies, and a rather misshapen Middle East. It was all really amazing, and in really good condition. Another thing of note: I found out tonight my school has a climbing wall in the basement! I've been attending meetings of "Club Concordia," which meets in the school basement every Friday evening at 7:00. It's the local hiking club, with members from three of the highschools in town. Usually they show slideshows of previous hikes, and plan new excursions. We already have snow in the mountains next to Lugoj (I saw it while walking to school today), and perhaps next weekend we're going to go skiing. In any case, tonight there was no slideshow. Instead, the kids decided to climb. When I heard this, I was intrigued...climb? where? They opened a door, which revealed a back room with a climbing wall. Not a big one, mind you (the cielings in the basement are only 8-10 feet high). But, nevertheless, there was a climbing wall, complete with a small bouldering course! I was amazed! So, of course, I climbed. It was fantastic! So, the Orthodox calendar has various Saint's days. Today was the day of St. Michael and St. Gabriel (Ziua Sfantului Mihail, Gavriel). Such days are cause for celebration for people who share thier name with the saint. It's rather a big deal. So, since my name is Michael, it was my day to "be a saint," along with all the other Mihai's, Mihaela's, Gabriel's and Gabriela's at the school. But, unlike in the States, when the celebration is in your honor, it's customary for you to be the one to give gifts or buy drinks. So, I brought in a box of pastries to share with my collegues in the English department. One of my fellow teachers, Mihaela, gave me a jar of home-made quince-jelly. Later on, during one of the breaks between classes, pizza was served in the teachers' room. Nearly all the teachers were present. There were many cheers of "noroc!" which means good luck, and "la multi ani!" which means to many years. Anyone named Mihai, Gabriela, etc. was smothered with hugs and kisses. There wasn't any mirror nearby to check, but I'm sure my cheeks were smeared with lipstick by the time it was all over. In the next break, I was again delayed in getting to class. I was about to rush off when one of the teachers asked me to wait in the Language teachers' office. I knew something was up, when the rest of the language teachers suddenly swarmed into the room. Mr. Barboni, the head of the English department (they call him Shakespeare because of his countenance) gave me a present from all the teachers. It was a mug that said, "even in Hell a gentlemen remains a gentleman." On the other side of it was a picture of a man sitting in a boiling cauldron wearing a monacle and a bow-tie, smoking a cigar and sipping a martini. The joke is that Romania is a hell-hole, but somehow we all manage to keep our heads. Romania is not in fact a hell-hole, but Romanians tend to have a somewhat pessimistic, self-depricating, but light-hearted sense of humor. For example, if a train is late, someone might say, "What did you expect? This is Romania after all..."
I'm learning to appreciate the sublties of Romanian sarcasm. And, what is more, I now have a proper mug for my tea! At the entrance. Had I yanked out the poles, the whole cave would've collapsed! Most of my excursions here in Romania seem to involve a rainy day, or at least the threat of rain. I've become accustomed to packing a rain jacket wherever I go. This past Sunday I went to a nearby cave with Cameron and a couple students from my school. It was a grey, overcast day. We had heard that they would be having a concert in the cave; they do every year. For the past 20 years or so, the location has been host to a symphonic concert, with a rock concert the following weekend. The symphonic concert was the weekend before, so logically, the rock concert was going to be this weekend. However, it wasn't. Unfortunatley, it took a train ride, a hitchhike, and an hour hike for us to find out. Apparently the organizers considered the weather less-than-favorable, and decided to cancel. Bummer. On the upside, however, we were the only ones there, and got the chance to explore the entire cave. It was much grander than I expected it to be. It must have extended at least a half a kilometer. There were several small stalactites, and one rather ancient limestone column. There was one room filled with the sound of squeaking bats. There were a few asleep, but I was surprised so many were awake. It was quite eerie to take a minute of silence and just listen to them chattering away...in complete darkness. There was absolutely no light in the cave, except for my headlamp. If I shut it off, I couldn't even see my hand in front of my face, literally. We left the cave as the sky started to spit. Eventually the spitting turned into a rather steady sprinkle, which in turn became a downpour. I puled out my trusty rain jacket; the others looked at me with disgust (having forgotten theirs). We walked for a while, till we reached the road running through the village of Romanesti. Not much was happening in town, let me tell you. We were hoping against hope that we could hitchhike, but cars were few and far between, at least ones going our way. Funny how Murphy's law works. Any that did come our way just passed on by, apparently unaffected by the sight of 5 wet and tired hikers. Just as I was resolving to walk the entire way to the main thoroughfare, my legs protesting the idea, I heard a faint rumbling noise, like that of an engine in the distance. I turned around to look behind, and saw a tractor crawling at a snail's pace around the bend. I thought for a brief second, said, "aw heck," and threw out my thumb. The guy driving was obviously amused by the idea that someone would want to hitchhike on his tractor, and he stopped. He happened to be towing a wooden wagon (caruta in Romanian, pronounced 'Karootza'). So we all jumped into the wagon, and held on for the bumpy ride. The rain had turned the dirt on the floor into a greasy mud. It brought back memories of my chilhood, when I would play with the puddles and mud in our driveway. In fact, that was probably the last time I'd gotten so dirty. It didn't help that as the tractor took off, it's spinning wheels flung bits of mud as us. The driver noticed, and threw us his jacket to use as a shield. The tractor simply crawled along, and the ride seemed to last forever. But, hey, this had to be better than walking, right? Heck, it was more fun! The driver stopped when we reached the main highway, a place where we would surely be able to get another ride. At that intersection was a restaurant called 'El Pepe,' a name which would imply Mexican food (but, alas, none was to be had). We stopped in there, to track our muddy paws to the bathroom and clean off. Ever since I moved in, the door to my bathroom was very difficult to shut. It would always take a tremendous shove to make it close completely. Once shut, getting it open again was another matter in itself. On top of these difficulties, the door made the most awful screeching sound as it opened and closed. Luckily, I solved that probelm by adding spacers to the hinges. But, just recently the door simply decided stop closing altogether. It's a very cheap door, made of compressed cardboard, and very susceptible to changes in humidity. I'd noticed it'd always been more difficult to close it after a shower. And, with all the rain we've been getting recently, it's little wonder that it swelled like a sponge. With winter approaching, I wanted to close the bathroom door to conserve heat. I knew the only solution would be to cut the door down a bit, but I lacked the neccesary tools. I talked to the school's carpenter last Friday. I told him the situation, and asked him to come to my apartment with a saw and some tools. He came, assessed the situation, and agreed with me. The door had to be trimmed. I naturally assumed that he'd take the door outside in the courtyard to cut it. But no, he proceeded to unhinge the door, and place it on my kitchen table and cut it right then at there...before I had a chance to say anything or move any of my dishes, jars, etc. By the time he was done, not only was my entire kitchen covered in a layer of dust, but so was everything in my bathroom. In any case, I spent about three hours vacuuming, washing, mopping and generally cleaning everything. But the door does work, finally!